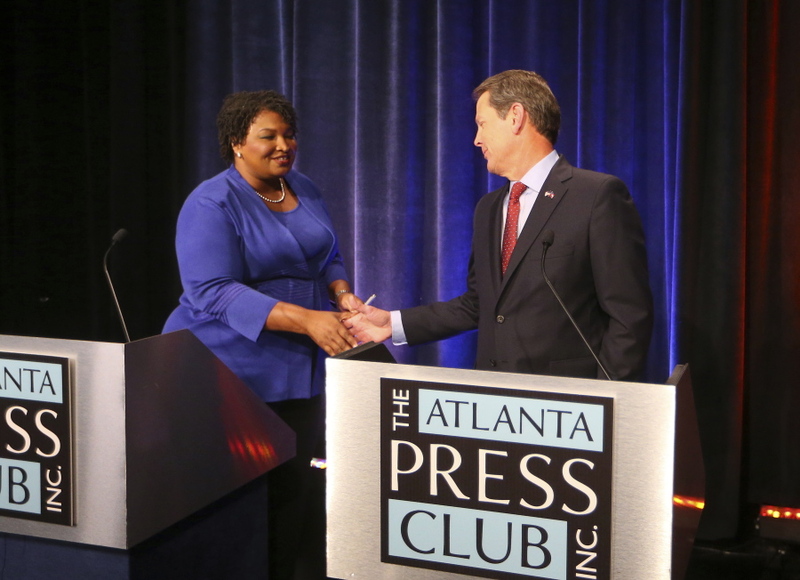 The first debate between Democrat Stacey Abrams and Republican Brian Kemp in the race for Georgia governor was dominated by charges of voter suppression and counterclaims of encouraging illegal voting. Disputes over voting access took center stage Tuesday night, highlighting Abrams’ historic bid to become the first black female governor in American history and the long-simmering politics of race in the Deep South. Kemp, who is white, fended off accusations that he’s using his position as Georgia secretary of state to make it harder for minority voters to cast ballots. Abrams said Kemp’s record as Georgia’s top elections official “causes great concern.” She pointed to the release of voter data under Kemp’s watch and the state’s “exact match” voter registration system, which has left tens of thousands of voter registrations “pending” due to inconsistencies. The Democrat said she takes voting rights “very seriously,” noting that her own father had been arrested for trying to help people get registered. “I’ve staked the integrity of my whole career on the duty that I have as secretary of state. I have always fulfilled and followed the laws of our state and I’ll continue to do that,” Kemp said. Kemp said his record includes making it “easy to vote and hard to cheat” in Georgia, and he fired back by citing a recent video clip in which Abrams includes “undocumented” immigrants in a description of her coalition. “Why are you encouraging people to break the law to vote for you?” Kemp asked. Abrams denied that, saying Kemp was twisting her words and her record of fighting to make it easier for legal citizens to vote. Libertarian candidate Ted Metz also participated in the debate as Abrams and Kemp traded barbs over education and health care policy. Abrams repeatedly emphasized her plan to expand Medicaid in Georgia, calling it a “bipartisan solution” that even Vice President Mike Pence embraced when he was Indiana’s Republican governor. Kemp said Abrams wants a “government takeover of health care” and will raise taxes to pay for it. The race is being watched as a barometer for the Democrats’ success in the midterm elections, as they try to make gains in Congress and in state offices to counter President Donald Trump’s agenda. Tensions escalated following a recent Associated Press report that more than 53,000 voter applications — nearly 70 percent of them from black applicants — were on hold with Kemp’s office ahead of the election. Kemp vehemently denied suppressing votes, insisting that people on the “pending” list can still vote if they bring an approved ID that substantially matches registration information. Kemp also hit back hard at Abrams, saying she’s “too extreme for Georgia.” Two reports surfaced just before the debate that played into their competing narratives. The New York Times reported that a 1992 Atlanta Journal-Constitution story identified Abrams as participating in the burning of the Georgia flag to protest the prominent Confederate symbol that had been added in the 1950s as a rebuke of the civil rights movement. Abrams also noted that Kemp was among the state lawmakers who voted to remove the divisive symbol after years of pressure. Kemp, meanwhile, was the focus of a report in Rolling Stone magazine, which said Kemp was secretly recorded telling supporters that he’s worried about an “unprecedented” number of people “exercising their right to vote” with absentee ballot applications after Abrams’ campaign focused on turning out its base. Kemp’s campaign did not address the audio recording in a statement, but said it was fighting to stop Abrams and the “San Francisco socialists and liberal billionaires from New York” that back her. Both candidates have attracted national heavyweights in a sign of just how seriously the parties are taking the contest. Abrams’ campaign has enlisted celebrities like recording artist John Legend, as well as politicians like U.S. Senators Corey Booker and Kamala Harris. She’s also been endorsed by former president Barack Obama. Kemp, who earned President Trump’s endorsement, saw visits from Donald Trump Jr., Vice President Mike Pence and U.S. Sen. Marco Rubio, among others.